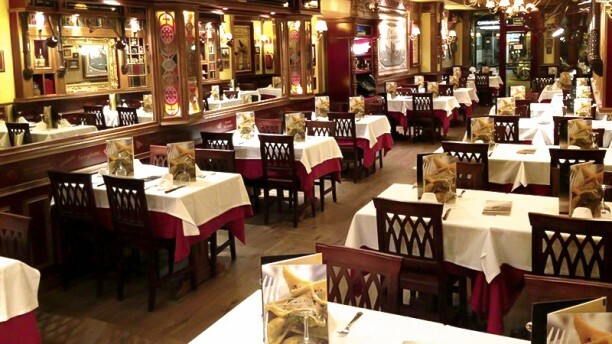 El restaurante La Tagliatella se emplaza en el corazón de Tarragona, justo al principio de la Rambla Nova. En esa situación, pone la maquinaria en marcha para reproducir el recetario más representativo de la gastronomía del norte de Italia. Para tal misión, el restaurante La Tagliatella Rambla Nova trae los ingredientes expresamente desde tierras italianas. De esa manera, el sabor alcanza una esfera de autenticidad superior. Toda una garantía a la hora de explorar una carta extensa en antipasti, risotti y excelentes pastas tradicionales, frescas y rellenas. Las pizzas son otra virtud de su cocina. Artesanales, masa fina y crujiente. Buenas piezas de carne y postres de toda la vida como el clásico Tiramisú redondean la oferta culinaria del lugar. Además, el restaurante La Tagliatella Rambla Nova cuenta con una terraza exterior climatizada y preparada para acogerte durante todo el año. ¿Vas a dejar que te lo cuenten? Lovely venue, great menu but disappointing service. After asking for pepper and salt three times, I eventually got up to get it myself. We also ordered the most expensive bottle of wine which was only served after 25 minutes and 2 times asking where it was since the firsf course had already been served. The coffee we ordered never came, only after we received the bill and, again, reminded them. Then, they took the first bill and dated to add the coffee to it. Very rude and not in balance with their prices. Nevertheless, the food was really good and they have a wonderful extensive italian menu. The food was very good with generous portions. We were quite rushed by the servers at the beginning, then they were inattentive later in the meal. Outstanding quality of simple food. Couldn't fault it.